Together with a colleague I have been developing novel means of removing brain tumours using a very small scalp incision and opening in the skull. The technique uses skills and equipment used in endoscopic skull base surgical operations we perform, and incorporates the neuronavigation technology. Traditionally, a relatively large scalp incision together with a generous opening in the bone of the skull has been required to expose brain tumours allowing surgeon to remove the tumour. This means a large area of the brain is exposed and also manipulated raising the chances of complications and a prolonged recovery after surgery. Our technique avoids many of these problems by the use of an endoscope, and thus allows a very small opening, and less manipulation of the brain itself. 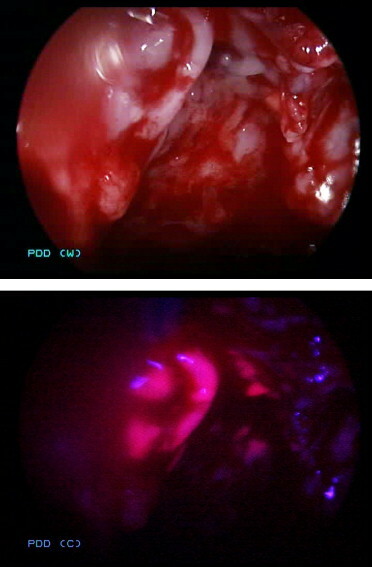 In the future we hope to incorporate this technology together with the use of a dye to light up tumours during surgery using a fluorescent light source via the endoscope.